Doug Robbins thought of the Olympics as something people sit and watch on television, seeing other people win gold medals, he told The Associated Press in June 1988. He never thought he'd have the chance to win one himself, he told The AP. "Just to get an opportunity to try out for the team is a real thrill," Robbins told The AP as his Stanford Cardinal team worked in the College World Series before Olympic tryouts. "It would be a great thrill to think you could represent your country." Robbins eventually won a spot on Team USA, helping the team to the gold. He also went on to turn pro, signing with the Orioles. Robbins, though, would never reach the pro baseball equivalent of a gold, making the majors. Robbins' pro career began after the Olympics, his signing put on hold until then. The Orioles selected him in the 10th round of that June's draft, out of Stanford. With Stanford, Robbins also helped get his team the equivalent of the gold, Stanford winning the 1988 College World Series. Stanford made the championship game with Robbins knocking in four runs, sealing the game against Fullerton State with a three-run shot. After Stanford's win over Arizona State to take the title, Robbins, Stanford's catcher, placed credit with his team's pitching, according to The Omaha World-Herald. "Our pitchers carried us for the first four games when we weren’t hitting," Robbins told The World-Herald. "They were all on. They pitched their best baseball, and they saved it for the right time." 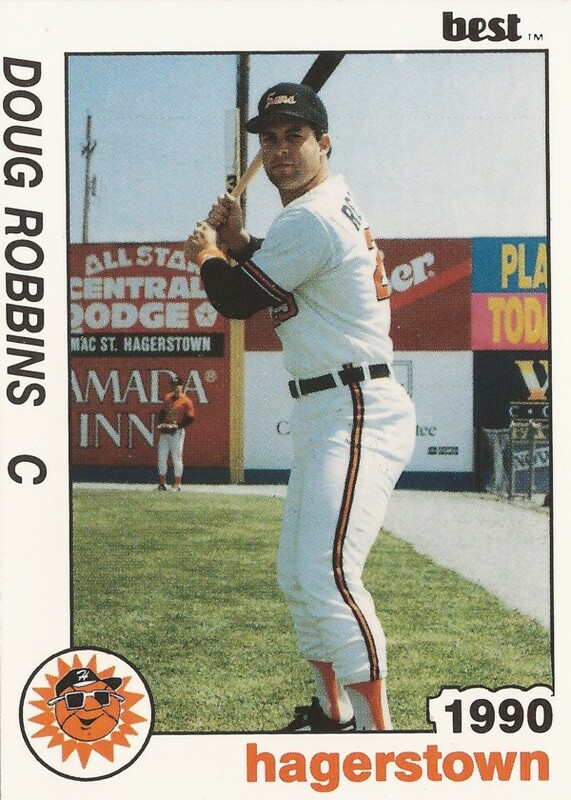 With the Orioles, Robbins first took the field in 1989, playing at single-A Frederick. Over 57 games there, he hit .310, with five home runs and knocking in 30. For 1990, Robins made AA Hagerstown, staying there for two seasons. He hit .242 his first season there and .304 his second. Robbins made AAA Rochester in 1992, hitting .306 over 93 games. But he never saw Baltimore. That May, Robbins was hitting well during a team slump, The Baltimore Sun wrote, so well that his manager put the backup catcher at first base to get him more at bats. "I see a lot of frustration," Robbins told The Sun of that team slump, "people putting pressure on themselves. We say someone has to step up and provide the spark that's needed. Everyone wants to be that person." Robbins moved to the Athletics system for 1993, playing the year at AAA Tacoma. After not being recorded as playing in 1994 or 1995, Robbins is last recorded as playing in 1996, for 12 games with independent Rhode Island. Baltimore Sun, May 31, 1992: Red Wings reeling from power shortage, but can Carey cure it?